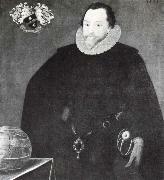 1540-1596,English admiral, the most renowned seaman of the Elizabethan Age. Brought up by his wealthy Hawkins relatives (see John Hawkins) in Plymouth, Drake went to sea at about age 18. He gained a reputation as an outstanding navigator and became wealthy by raiding and plundering Spanish colonies. In 1577 he set sail with five ships, but ultimately only his flagship, the Golden Hind, made its way through the Strait of Magellan into the Pacific and up the coast of South and North America. He sailed at least as far north as what is now San Francisco, claiming the area for Elizabeth, and continued westward to the Philippines and around the Cape of Good Hope. Having circumnavigated the globe, he returned to Plymouth, Eng., in 1580 laden with treasure, the first captain ever to sail his own ship around the world. In 1581 he was knighted. Appointed vice admiral (1588), he destroyed ships and supplies destined for the Spanish Armada and delayed the Spanish attack for a year. But he is not known to have played any part in the battle that eventually occurred. In his lifetime, his reputation at home was equivocal, yet his legend grew. On his last voyage he succumbed to fever and was buried at sea.